For metal-insulator-metal (MIM) capacitors applicated in the fields of RF, DRAM, and analog/mixed-signal integrated circuits, a high capacitance density is imperative with the downscaling of the device feature size. In this work, the microwave annealing technique is investigated to enhance the dielectric characteristics of Al2O3/ZrO2/Al2O3 based MIM capacitors. The results show that the permittivity of ZrO2 is increased to 41.9 (~ 40% enhanced) with a microwave annealing at 1400 W for 5 min. The substrate temperature is lower than 400 °C, which is compatible with the back end of line process. The leakage current densities are 1.23 × 10−8 and 1.36 × 10−8 A/cm2 for as-deposited sample and 1400 W sample, respectively, indicating that the leakage property is not deteriorated. The conduction mechanism is confirmed as field-assisted tunneling. Metal-insulator-metal (MIM) capacitors have been widely used in the fields of radio frequency (RF), dynamic random access memory (DRAM), and analog/mixed-signal integrated circuits. With the scaling down of the device feature size, it is desirable to obtain an ever higher capacitance density. For example, the capacitance density is required to be greater than 10 fF/μm2 according to the 2020 node of the International Technology Roadmap for Semiconductors (ITRS) . As a consequence, a large number of high-κ materials have been investigated, such as HfO2 [2–6], ZrO2 [7–14], Ta2O5 [15–18], and TiO2 [19–24]. Among these high-κ materials, ZrO2 has a dielectric constant (κ) of 16~25 (monoclinic phase) and a bandgap of 5.8 eV. However, the κ value of ZrO2 can be enhanced to 36.8 and 46.6 when it is crystallized into cubic and tetragonal phase, respectively . Hence, the capacitance density can be further increased. The microwave annealing (MWA) technique has been tremendously explored for the dopant activation in silicon [26–28] and the silicide formation [29, 30] due to its lower process temperature compared with conventional thermal processing techniques. In addition, Shih et al. investigated the effect of MWA on electrical characteristics of TiN/Al/TiN/HfO2/Si MOS capacitors. Some key parameters such as equivalent oxide thickness, interface state density, and leakage current density were all improved. In this work, the effect of MWA on electrical properties of TaN/Al2O3/ZrO2/Al2O3/TaN (TaN/A/Z/A/TaN) MIM capacitors is investigated. With the usage of MWA, the permittivity of ZrO2 is remarkably enhanced and the leakage current density is slightly increased. Moreover, the underlying conduction mechanism is also studied. 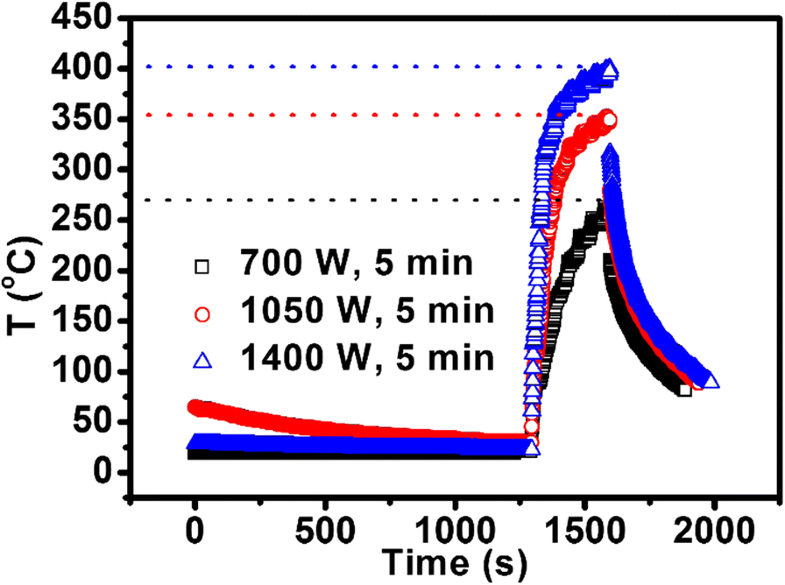 Firstly, a 500-nm-thick SiO2 film was grown onto Si substrate by PECVD, followed by deposition of TaN (20 nm)/Ta (100 nm) films, and TaN was grown by sputtering Ta target in N2/Ar plasma. 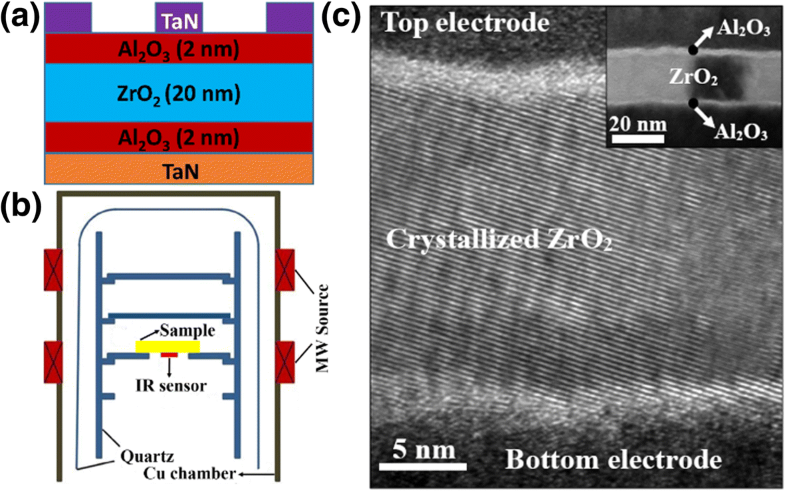 Subsequently, the Si wafer coated with the TaN/Ta films was transferred into the ALD chamber, and the nano-stack of Al2O3 (2 nm)/ZrO2 (20 nm)/Al2O3 (2 nm) were deposited at 250 °C. Al2O3 and ZrO2 films were grown from Al (CH3)3/H2O and [(CH3)2N]4Zr/H2O, respectively. It is worth mentioning that an ultrathin Al2O3 layer between the bottom TaN electrode and the ZrO2 layer was inserted to restrain the formation of interfacial layer during ALD and post-deposition annealing. Afterwards, the samples were subject to the microwave annealing. MWA was performed in a DSGI octagonal chamber at 5.8 GHz. During annealing, the samples were placed at the middle of the chamber, where the electromagnetic field is most uniform. The in situ temperature of the samples was monitored by a Raytek XR series infrared pyrometer facing the backside of the samples. The power was varied from 700 W to 1400 W with a fixed annealing time of 5 min. Finally, a 100-nm-thick TaN top electrode was formed in turn by reactive sputter, lithography, and reactive ion etching. The ALD film thicknesses were measured with an ellipsometer (SOPRA GES 5E) and confirmed by transmission electron microscope (TEM). Capacitance-voltage (C-V) was measured by a precision impedance analyzer (Agilent 4294A) with a 50 mV AC amplitude. Current-voltage (I-V) measurements were performed with a semiconductor device analyzer (Agilent B1500) in a dark box. The bias was applied to the top electrode. The schematic structures of the A/Z/A based MIM capacitor and the MWA chamber are shown in Fig. 1a and b, respectively. Figure 1c exhibits the cross-sectional TEM image of the A/Z/A-based MIM capacitor which is subject to the MWA at 1400 W for 5 min. It is observed that the ZrO2 layer is fully crystallized and the stacked layers can be distinguished clearly, see the inset. Figure 2a shows the cumulative probability plot of the capacitance density at different annealing power. The results show that the capacitance densities of the MIM capacitors are 7.34, 8.87, 8.96, and 9.06 fF/μm2 respectively for 0, 700, 1050, and 1400 W at a 50% cumulative probability. Therefore, the capacitance density is increased under the effect of microwaves. The very narrow distribution of the capacitance density for the A/Z/A stack MIM capacitors with MWA indicates very good annealing uniformity. The inset in Fig. 2a exhibits the typical CV curves of all the samples. Excluding the effect of Al2O3 (κ ≈ 8), the dielectric constants of the ZrO2 films are extracted as 28.3, 40.1, 41, and 41.9 for 0, 700, 1050, and 1400 W, respectively, revealed by Fig. 2b. Regarding the microwave power of 1400 W, the dielectric constant of the ZrO2 film increases by 40% compared with the as-deposited sample. The significant enhancement of the permittivity of ZrO2 can be ascribed to the high-degree crystallization during the microwave annealing, shown in Fig. 1c. As mentioned above, the dielectric constant of ZrO2 can be enhanced to 36.8 and 46.6 when it is crystallized into cubic and tetragonal phase, respectively . Hence, the XRD measurement was performed to further investigate the mechanism of the dielectric constant enhancement. As exhibited in the inset of Fig. 2b, a peak existed at ~ 30. 7° after the MWA processing at 1400 W, indicating the appearance of the tetragonal phase (111) in ZrO2 [32, 33]. The presence of this tetragonal phase is responsible for the enhancement of the dielectric constant from 28.3 to over 40. Since the MIM capacitors are fabricated in the back end of line (BEOL) of integrated circuits, the process temperature must be lower than 400 °C . As shown in Fig. 3, the temperature curves of MWA indicate that the highest temperatures of the substrate are 260, 350, and 400 °C for 700, 1050, and 1400 W, respectively. Therefore, MWA is compatible with the CMOS process from the viewpoint of process temperature. 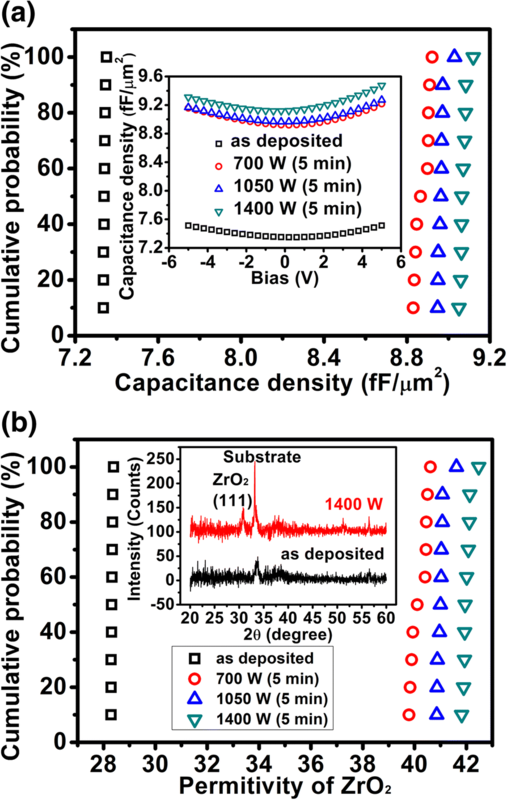 Furthermore, in the previous work , Al2O3 (2 nm)/ZrO2 (20 nm)-based MIM capacitors were subject to rapid thermal annealing (RTA) at 420 °C for 10 min in N2/H2 ambient and the resulting dielectric constant of ZrO2 was evaluated as 40. For RTA, the annealing time was kept constant at 420 °C for 10 min, so the thermal budget was much larger compared with MWA. For MWA [35, 36], dipole polarization is thought to be the most important mechanism for energy transfer at the molecular level. When materials in contact have different dielectric properties, microwaves will selectively couple with the higher dielectric loss materials. In contrast, conventional RTA transfers heat most efficiently to materials with high conductivity. Leakage current is another important parameter for MIM capacitors. As shown by Fig. 4a, the leakage current curve can be divided into two sections for all the samples since there is an obvious turning point, indicating different electron conduction mechanisms. As for the samples with MWA processing, the voltage corresponding to the turning point is smaller compared with the as-deposited sample. Table 1 lists the leakage current density at ± 4 V for all the samples. Take 4 V for example, the leakage current density is increased from 1.06 × 10−7 to 1.92 × 10−5 A/cm2, i.e., two orders of amplitude enhanced when the microwave power is augmented from 0 to 1400 W. Due to a high crystallization of the ZrO2 film, a large number of grain boundaries will appear and serve as the leaky path, thus enhancing the electron conduction under a high electric field. 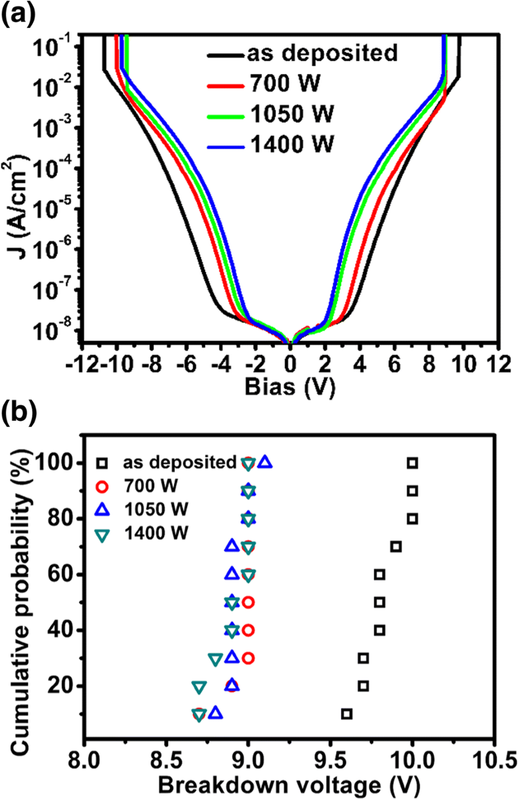 However, considering a working voltage of 2 V, the leakage current densities are 1.23 × 10−8 and 1.36 × 10−8 A/cm2 for as-deposited sample and 1400 W sample, respectively. Obviously, the microwave annealing has little effect on the leakage performance under a low electric field. Furthermore, the breakdown voltage was extracted from the I-V test and plotted in Fig. 4b. For the as-deposited sample, the breakdown voltage is about 9.8 V at a 50% cumulative probability. With the application of MWA, the breakdown voltage is reduced to ~ 9 V. This reduction of breakdown voltage could be related to the change of the ZrO2 microstructure. where A is a constant, E is the electric field, q is the electronic charge, m* represents the effective electron mass (about 0.25 m0, where m0 is the free electron mass), k is the Boltzmann constant, φt is the energy barrier separating traps from the conduction band, and h is the Planck’s constant. where kA and κZ represent the dielectric constants of Al2O3 and ZrO2, respectively; EA and EZ denote the electric fields across Al2O3 and ZrO2, respectively; dA and dZ equal the thicknesses of Al2O3 and ZrO2, respectively; and Vstack is the voltage applied to the stack. Accordingly, Ln (J/EZ2) versus 1/EZ was arbitrarily plotted in Fig. 5, where a straight line fitting was achieved in the high field region for each sample under electron bottom-injection (see Fig. 5a) or electron top-injection (see Fig. 5b). This means that the FAT mechanism is dominated at high electric fields. 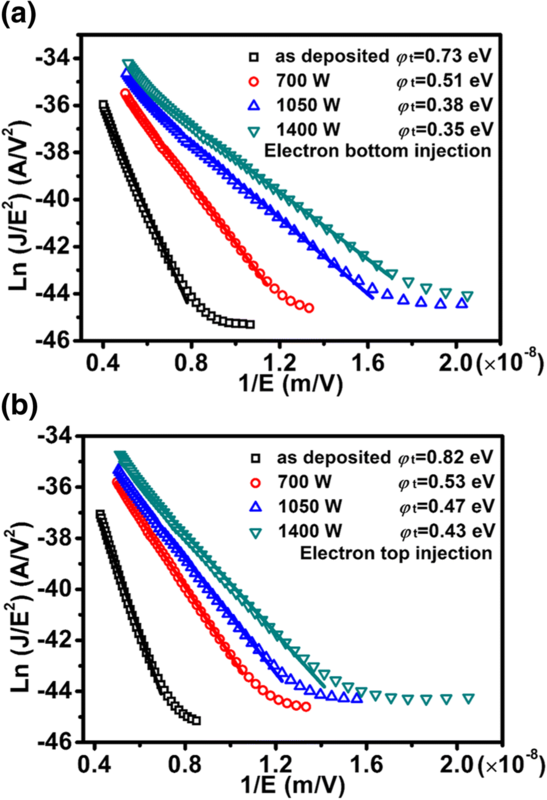 The extracted φt is 0.73, 0.51, 0.38, and 0.35 eV respectively for as-deposited, 700 W, 1050 W, and 1400 W sample under electron bottom-injection. In terms of electron top-injection, the corresponding φt is 0.82, 0.53, 0.47, and 0.43 eV, respectively. Therefore, some shallow traps are induced by MWA. The shallow traps are reported to arise from the grain boundary defects that can introduce additional electronic states near the conduction band . In addition, the conduction mechanism at low fields is most likely trap-assisted tunneling (TAT). Atomic layer-deposited Al2O3/ZrO2/Al2O3 nano-stack is used as the insulator of the MIM capacitors. With the effect of MWA at 1400 W for 5 min, the capacitance density is increased to 9.06 fF/μm2, approximately 23.4% of capacitance enhanced. Decoupling the influence of Al2O3, the dielectric constant is deduced as 41.9 for 1400 W sample (~ 40% of permittivity increased). Such enhancement of the permittivity is originated from a high crystallization of the ZrO2 film. In addition, the substrate temperature is lower than 400 °C, which enables MWA compatible with the BEOL process. This lower substrate temperature can be attributed to the selective heating on the materials of MWA. In terms of a working voltage of 2 V, the leakage current densities are 1.23 × 10−8 and 1.36 × 10−8 A/cm2 for as-deposited sample and 1400 W sample, respectively. The dominated conduction mechanism in the high electric fields is confirmed as a FAT process. The leakage current in the low electric fields is likely dictated by TAT. Based on the above facts, the microwave annealing is a promising technique used in the CMOS process to enhance the dielectric performance of the MIM capacitors. This work was supported by the National Key Technologies R&D Program of China (2015ZX02102–003), the National Natural Science Foundation of China (61474027) and the Project funded by China Postdoctoral Science Foundation. All datasets are presented in the main paper and freely available to any scientist wishing to use them for non-commercial purposes, without breaching participant confidentiality. BZ carried out the main part of fabrication and analytical works. XW and WJL participated in the sequence alignment and drafted the manuscript. SJD, DWZ, and ZF conceived the study and participated in its design. All authors read and approved the final manuscript.